This reference to “Chicoga” is rare this early. From 1825 to 1831, Chicago was a hamlet of about 100 residents in Peoria County. In 1831, Cook County was organized. The next year, many white settlers in northern Illinois fled to Chicago to avoid Black Hawk’s forces. By 1833, when Chicago was organized as a town (a year after this letter), it still only had about 350 residents. Even earlier letters in the archive, by fur trader, St. Louis pioneer, and first lieutenant governor of Illinois Pierre Menard, and by three of his daughters, and son-in-law George Kennerly, offer glimpses into a pioneering bilingual community. The Menard, Gratiot, Chouteau, and other French creole families founded St. Louis, Kansas City, and additional cities in the Mississippi and Missouri River valleys. 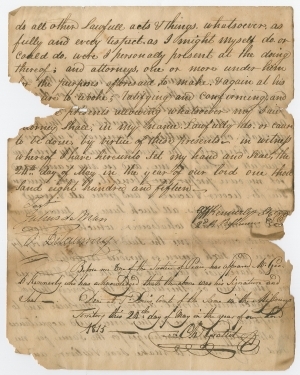 The archive starts with an 1815 power of attorney signed by George Kennerly, with the very rare signature of pioneer fur trader Charles Gratiot who certifies it. Includes the first letter in English written by Alzire Menard, to her soon-to-be-husband George Kennerly. This archive illuminates several facets of American Westward Expansion. It ends with a poignant letter of Amadee Menard, celebrating her 23rd birthday, and contemplating whether she would live to see her 24th birthday: “It is ever thus with those who are young and possess buoyant spirits. Time will soon tell what fortune has in store for me…” Unfortunately, Amadee died ten months later. [WESTWARD EXPANSION]. 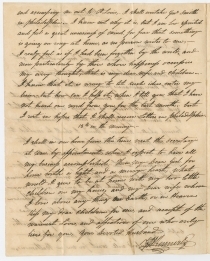 11 Handwritten Documents, 1815-1843, centering around George H. Kennerly and his wife Alzire Menard Kennerly, daughter of pioneer fur-trader Pierre Menard. Four are written in French. 21 pp., most approximately 8 x 10 in. Documents have expected toning. A few have some tears on folds and holes with small text loss. George H. Kennerly (1790-1867) was born in Virginia and moved with his brother James Kennerly in 1813 to St. Louis, where he became a trader and merchant. He served as a lieutenant in the War of 1812, and carried the American flag and terms of surrender to the British when a small group of Americans of the 7th U.S. Infantry surrendered on July 20, 1814. They had defended the fort at Prairie du Chien at the confluence of the Mississippi and Wisconsin Rivers, when they were besieged by a much larger British and Native American force. In 1816, Kennerly engaged in a duel with Henry S. Geyer, in which Kennerly was wounded in the knee; they afterward became good friends. In 1828, Kennerly became postmaster of Jefferson Barracks. Late that year, he commanded an expedition with representatives of the Chickasaw, Choctaw, and Creek to explore land in modern Oklahoma for resettlement. During the Mexican War, he served as an Assistant Quartermaster. His sister Harriet Kennerly (1788-1831) married William Clark (1770-1838) of Lewis and Clark Expedition fame in 1821. Charles Gratiot (1752-1817) was born in Switzerland as a descendant of the Huguenots. He migrated to Montreal to work with an uncle in the fur trade. In 1777, he moved to the Illinois country and opened a store in Cahokia. He became an influential trader, providing supplies to George Rogers Clark’s Illinois campaign in 1778 and 1779. In 1781, he moved to St. Louis, where he married Victoire Chouteau, with whom he had thirteen children. After the Revolutionary War, he went to Virginia to seek reimbursement for the supplies he gave Clark’s men. He received land grants in Kentucky as payment. In 1795, Gratiot hosted William Clark in St. Louis and also assisted Meriwether Lewis as a translator with the Spanish governor. In 1804, Gratiot served as an official witness to the transfer of Upper Louisiana to the United States. He served as a judge of the court of common pleas, a justice of the peace, and clerk of the board of land commissioners in St. Louis. Some loss at the edges, toning. 2a. JULIE CABANNE. 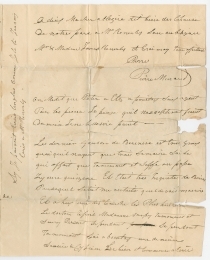 Autograph Letter Signed, to Alzire Menard, February 7, 1823, St. Louis, Missouri, in French. Julie explains that her cousin has only been able to send two small flannel bonnets because they are so expensive, and that she cannot get any of the seeds Alzire had wanted. Julie Antoinette Cabanne (1809-1836) was the daughter of Julie Gratiot Cabanne (1782-1852), the oldest child of Charles Gratiot and Victoire Chouteau Gratiot, and Jean Pierre Cabanne (1773-1841), a merchant born in France. Julie Antoinette Cabanne married James Wilkinson Kingsbury (1801-1853), and they had three children between 1832 and 1835. Virginie Labadie (c. 1808-1828) was a member of one of St. Louis’s founding families. In June 1827, she married Joseph-Aimé Syre (1799-1854), and they had one child before her death. 3. ALZIRE MENARD. 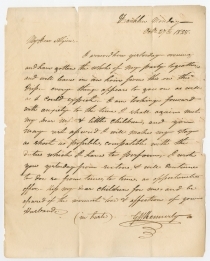 Autograph Letter Signed to George H. Kennerly, August 5, 1825, St. Louis, Missouri. 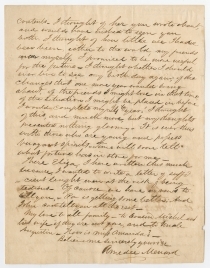 Telling George that her father has agreed to allow their marriage, assuring him of her love, and noting that this is the first letter she has written in English! I would not write to you before as I wished to give you my father’s answers; I just received it at this moment. he gives his approbation to our union. With [?] joy I received it But it was very soon repressed by the t[h]ought of your absence. It is out of my power to taste of aney pleasure that I can not enjoy with you. The letters wich you wrote me and in which you express so well your tenderness and esteem towards me is a great consolation to me. For I feel very well that on both your love and esteem depends my happiness. You posess my whole confidance. It is in you that I have placed all the prospects of my future happiness. Of my love you can not have any doubt for I have given you proofs enough of my inviolable attachment. My only desire is to see you returned and I will be perfectly satisfied as I hope you shall always share the same sentiments towards me. I would have written to you before but I find such difficulty in expressing my feelings towards you in writing in a different language that it almost discourages me. you must remember that this is the first letter in English that I have written in my life so you must excuse me. I shall await your arrival with all the impatience of true love try to make of our absence as short as possible. Adieu believe in my sincerest attachment s. Yours t[h]rough life. Modeste Alzire Menard Kennerly (1802-1886) was born in Kaskaskia, Illinois, to Pierre Menard and Thérèse Godin dit Tourangeau. She married George H. Kennerly on December 27, 1825. They had ten children between 1827 and 1843. Three of their sons fought in the Confederate army. She died at Carondelet, Missouri. Old tape repairs. (to be re-done by professional conservator). Three years later, on May 25, 1830, Julie Cabanne married her “house friend” James W. Kingsbury. Mr. Saugnee may refer to Father Edmond Saulnier (1798-1864), who lived in St. Louis from 1818 to 1842. He became quasi-Pastor of the Cathedral in 1824, preaching in both French and English. Menard “had much pleasure in learning that M. Kennerly was happily returned from his voyage in the upper Missauri” but surprised and disturbed that “Peter had left without an agent for les peorea [Peoria, Illinois].” Menard informs his daughter of letters he has received, from whom, and in what language they were written. “If I can write in English I will write to Mr. Kennerly,” he promises. Her half-brother Louis (1819-1870) had received special mention in English grammar and geography during the recent Christmas exams, but worried that he would not be able to write his sister “in good English.” Half-brothers Saucir (1817-1832) and Cyprien (1819-1870) were reading well and also starting to write, possibly in both French and English. Pierre Menard (1766-1844) was born near Montreal, the son of a French soldier, and joined a fur trading expedition to the Illinois Country at about age fifteen. By 1791, he had established his own trading business in Kaskaskia. He made a fortune supplying Americans and Europeans with beaver hats and other pelts. In 1792, he married Thérèse Godin dit Tourangeau (1773-1804), with whom he had four children. Two years after her death, Menard married Angélique Saucier (1783-1839), with whom he had eight more children. Menard served in the Indiana Territorial Legislature from 1803 to 1809 and as president of the Illinois Territorial Council from 1812-1818. The area was inhabited by French settlers as part of New France and Upper Louisiana, and included a significant French-speaking population when it became a state in 1818. He was asked to be the state’s first governor, which he turned down due to his lack of English fluency, but did serve as the first Lieutenant Governor. Menard left office and returned to his business interests in 1822. Berenice informed Alzire that she had recently had a baby, Louis-Sylvestre Chouteau (1827-1829), her fourth of nine children, and encouraged Alzire to have a baby. By coincidence, Alzire Kennerly had her first child, Elizabeth Clark Kennerly (1827-1910), the day after Berenice wrote this letter. Berenice Therese Menard Chouteau (1801-1888) was born in Kaskaskia, Illinois, the daughter of Pierre Menard and Thérèse Godin dit Tourangeau Menard. In 1819, Berenice married Francois Gesseau Chouteau (1797-1838), the son of a prominent fur trader. They made their home on the Missouri River near the future site of St. Joseph, Missouri. After living there for two years, they moved to Kansas City, Missouri, where they established a trading post. After her husband’s death, she managed his retail and real estate holdings. She was actively involved in the community and donated generously to Kansas City’s Roman Catholic Church. Berenice Chouteau, “the soul of the colony,” outlived all of their nine children. The expedition is now named after Isaac McCoy (1784-1846), a Baptist missionary among the Pottawatomie and Ottawa in Indiana, Michigan, and Missouri. McCoy was strong advocate of the removal of Native Americans to west of the Mississippi River, theoretically to avoid corruption and exploitation by white Americans. McCoy led two Congressionally authorized expeditions in 1828 into the areas of Kansas and Oklahoma to scout possible locations for Native American resettlement. 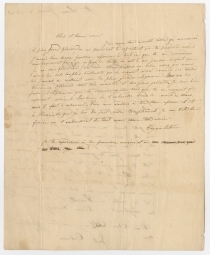 McCoy traveled on to Washington, D.C. On January 29, 1829, he submitted a report to Secretary of War Peter Buell Porter (1773-1844). “I have not as yet been enabled to get my business accomplished with the Secretary of War [John Henry Eaton] .... The crowd around him is so great and the multiplicity of business so extensive that it is almost impossible for him to transact any business at all, - however I think I shall be enabled to leave this place, for Philadelphia by the day after tomorrow, and then nothing shall impied my progress home to the bosom of my dear family.... I think that I am in a fare way of getting back the whole of the sutling at Jefferson Barracks, and if I succide, I shall make purchases of goods to that object. Genl Smith, Capt Rogers, and Sanford left here yesterday morning. Sanford will wait for me in Baltimore and accompany me out to St Louis. I shall overtake Genl Smith in Philadelphia. I know not why it is, but I am low spirited and feel a great uneasiness of mind, for fear that something is going on rong at home, as no person writes to me. I realy feel as if I had been forgotten by the world, and now particularly by those whose happiness occupies my every thought… I rest in hopes that I shall receive letters in Philadelphia. The business with the Secretary of War clearly had to do with Kennerly’s recent expedition. John Henry Eaton (1790-1856) served as Andrew Jackson’s first Secretary of War from March 9, 1829 to June 18, 1831. His wife Peggy became the focus of the Petticoat affair, when other cabinet members’ wives refused to socialize with the Eatons. Kennerly was the first postmaster of Jefferson Barracks from 1828 to at least 1831. Wilson P. Hunt (1783-1842) served as postmaster of St. Louis from 1822 to 1840. Jefferson Barracks, about ten miles South of St. Louis, was opened in 1826. It is the oldest operating U.S. military installation west of the Mississippi River. Kennerly served as sutler for the 6th U.S. Infantry at Jefferson Barracks and likely accompanied them to northern Illinois during the brief Black Hawk War. In April, 1832, Black Hawk crossed from Iowa Territory into Illinois, planning to resettle on tribal land that had been ceded to the U.S. in the disputed 1804 Treaty of St. Louis. American officials became convinced (likely incorrectly) that the “British Band” was hostile, and mobilized a frontier militia which opened fire on an Indian delegation on May 14. Black Hawk responded by attacking and beating the militia at the Battle of Stillman’s Run. While U.S. troops were pursuing Black Hawk, other Native American groups raided forts and settlements that had been left largely unprotected. 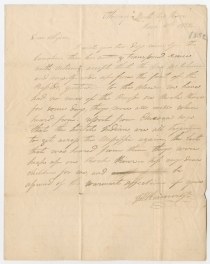 Two weeks before this letter, Captain Abraham Lincoln had been in Ottawa. His company was mustered out of service, but Lincoln re-enlisted as a private for twenty days of additional service. Lincoln left Ottawa on June 6, three days before Kennerly’s arrival there. On July 21, the militia overtook and defeated the British Band at the Battle of Wisconsin Heights. On August 2, at the Battle of Bad Axe, most of Black Hawk’s remaining warriors were killed or captured. Though Black Hawk and other leaders escaped, they later surrendered and were imprisoned for a year. The war furthered support for the policy of the “removal” of Native American tribes to west of the Mississippi River. Amedee Menard (1820-1844) was Pierre Menard’s daughter by his second wife Angelique Saucier. She died at 23 years old, in Peoria, Illinois in September 1844. Her father lived to 77. Kaskaskia was the home of the first Illinois General Assembly, before the capital was moved to Vandalia in 1820. 12. With an additional letter to “Friend Julia”. Brimfield, April 12.